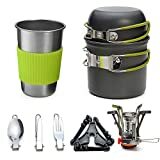 I have been doing quite a bit of researching into cooking and camping to prepare me for my first camping experience this year. I have done a round up of what I found useful and what made my camping trip a success. What you cook and what you need to take is going to vary depending on where you are camping, who is camping and how long you are camping. Plan your meals in advance : Knowing what you are going to cook will mean you know what equipment you will also require. There is no use taking a frying pan if you are only going to be heating up tinned food. Plan your meals around your needs, there are loads of meals perfect for camping. I was camping solo but pitched next to friends. I therefore only wanted meals for one and didn’t want to spend all my time preparing and cooking so I took meals that simply needed heating. I also had dried food meals that just needed hot water adding and these were so filling but a little expensive. The next time I just took canned food that was much cheaper and still as filling. 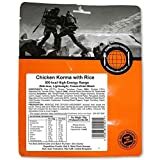 Pack of 6 Ready To Eat Camping Meals. My friend however had taken some vegetables and spices and cooked healthy meals but I was happy with just heating up my food. The food you want to cook will depend on how many are camping and how long you are camping for. For example if you are a family with children you may want more nutritious meals, for me when I am camping solo it is more about filling me up rather than having a meal. But if I was camping for a longer period like next year I plan to go camping for a week I will probably want more substantial meals. Also if I was camping with friends the meal would be more of a social thing and therefore I would probably prepare different meals. Have the right camping table : I never even thought about taking a camping table until my neighbour offered me hers. It made life so much easier but hers was quite low so when I went camping the second time I bought one at normal height which was so much easier on my back. I also made sure I had a folding camping table so it didnt take up too much room when travelling to the camp site and I could also put it away when I didn’t need it. However during my last camping trip I did keep it up for the duration as it was so useful. If I go camping with family and friends I would like to have one of these tables with benches as I think these will be perfect for eating as a group. Take a washing up bowl : Again something I didn’t think of but saw people using then during my first camping trip so on the second trip I made sure I had one and again it came in handy. Use pots with a cover : If your pots do not have a cover then this is where heavy duty tin foil will come in handy. Covering your pots will mean you food heats quicker saving fuel but it also means nasty bugs and bits of grass will not get into your cooking. Take food zip close bags : These are my go to item for all my travels as I find then so helpful. 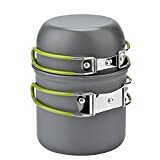 Perfect for taking ingredients with you and then if you don’t finish your food you can keep it fresh. I am all for ease when camping. I will take foods with me that don’t need preparing so I am happy with a sandwich on the first day which I can prepare at home. Pitta bread seems to stay fresher for longer and doesn’t get squashed. Kitchen roll and Black bin bags : I used kitchen roll for cleaning pots, wiping my hands, wiping down surfaces, just about anything I am so glad someone told me to take some as it was useful. Also black bin bags. I used then for rubbish, packing things up to bring home and even for putting wet clothes into to stop them getting everything else soaked again a very useful item when camping. Do you have any tips for cooking and camping if so please let me know as I am still learning and need to prepare for camping next year.